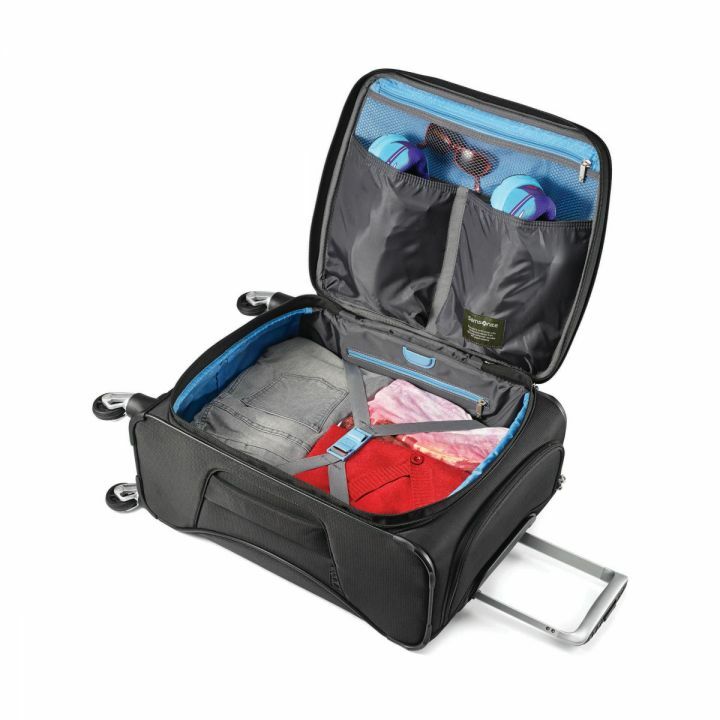 Smart Top Storage allows easy access and storage for important items during security checks and throughout travel .Smart Fix Buckles keeps tie down straps and buckles out of your way during packing – makes it easy to secure items when fully packed. Patent pending unique wrap-around frame design is lightweight, strong, and stylish. In another case of a recycled content item, that no one would every guess is recycled content, here is the Samsonite ECO-Glide™ 20″ Expandable Spinner. In the Samsonite ECO-Glide™, Samsonite has designed all textile fabrics, including the lining, to be created from 100% post-consumer recycled plastic, mainly from bottles. So it you are in the plastic bottle business, or a beverage distributor, with a traveling workforce, the Samsonite ECO-Glide™ is a perfect travel companion to serve as your brand ambassador. Artwork can be added to the bag, included with your logo, along the lines of “I used to be a water bottle”. Or along the lines of ” We take your trash, and help turn it into bags like this”. You get the idea. (Decoration is only available on luggage tag is included with spinner). Other than the bag’s recycled content, the Samsonite ECO-Glide™ is just a really nice travel bag. The Samsonite ECO-Glide™ uses Samsonite’s Saguaro™ Wheel System, which is engineered for lighter weight and high performance. The bag weights in at just 7lbs empty, and fits most carry on guidelines. If you are interested the Samsonite ECO-Glide™ to promote your own business, or to get a sample, email info@proformagreen.com for information and pricing.